The Zhuyeqing tea is easy to like with her medium rich body, bamboo shaped tea buds and high-pitched floral aroma. The most famous tea of modern China, it is difficult to imagine she was invented only in the 1960s. Gold medallist of the 24th World Food Exposition (held in Portugal in 1985), Zhuyeqing tea is the poster child of Sichuan province's tallest mountain - Ermei Shan. While the mountain range peaks at 3,000 meters, tea plants grow predominantly at an altitude of 800 to 1,200 meters in the misty clouds. The name Zhuyeqing means Bamboo Leaf Green. The AAA grade is the highest grade of Ermei Mountain. Harvesting standard is high - only one bud with two adjacent leaves are picked. Rolling takes place in three stages. The tea buds are such a delight to behold, and reminds me of the Tribute Dragon Well tea. The leaves are a glossy green, shaped like a flat spear with two sharp ends - like a bamboo leaf. Also, notice how uniform the tea buds are. 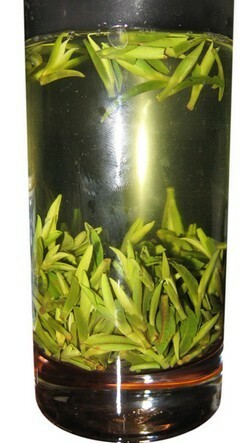 The tea liquor has a medium rich body, high frequency floral aroma and a long aftertaste. I give the Zhuyeqing a 5/5! I find that I prefer the fuller bodied teas - perhaps that is a result of my tea taste being not fully evolved yet, as I've only been into these types of green teas for a couple of months now (amazing though - I can't even THINK of drinking a green tea from a grocery store tea bag any more; YUCK!). Thus, I want to try the Lushan tea. Don't know if you've ever tried Korean green teas - has an interesting history. I've only tried a very high quality Myoungsul saejak (early June harvest), which is quite full-bodied and I really love it. I'm waiting to receive my first shipment of uijeon (earliest spring) tea to compare. I find the Zhuyeqing somewhat comparable to the Myoungsul saejak, just a little lighter. The flavor is so toasty and mellow - simply amazing. This tea is truly quite different than any other green tea I've had. The smell is a blend of sweet grass and asparagus and the taste (when I get it right) is just as special. I really love grassy teas and this one is grassy for sure. If you love sencha tea and asparagus then you will absolutely want to get this tea. I notice that if I steep this longer than 5 minutes it can get a little sharp so be mindful about not forgetting about it while it's steeping away. 2 steeps obtained for sure with a decent third steep once in a while from this tea. I've loved all the teas ever ordered from Amazing Green Tea and this one is no exception. I was looking for something similar to a Dragon Well though of high-quality with a refined taste and this meets what I was seeking. It brews up nicely as an every day green tea with a bit more bite then a white tea but not to astringent or bitter. It took me time to get used to this tea, but now I would like to drink it every morning. It is the perfect cup of tea in the morning just before going to work. Not very strong taste but an interesting after taste. The tea was delivered properly and well packed. Up to now I did not try it but it looks great, as expected. Zhuyeqing tea should be brewed the same way as the Dragon Well tea by infusing a small amount of leaves in high temperature water for as long as it takes.